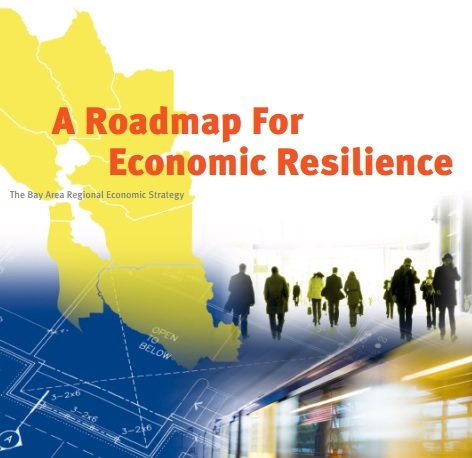 DECEMBER 8, 2015 — My last story about the continuing power struggle between the Association of Bay Area Governments and the Metropolitan Transportation Commission ended with a question: do the executive directors of these two agencies endorse the recommendations to expand regional planning authority at the expense of local control that are put forth in the Bay Area Council Economic Institute’s recently publishedRoadmap for Economic Resilience: The Bay Area Regional Economic Strategy? The story was posted around 2 p.m. on Thursday, November 12. Twenty-four hours later, the answer was clear, at least with respect to ABAG Executive Director Ezra Rapport. Speaking in Oakland at the annual conference of the Bay Area Planning Directors Association, Rapport said that “in my opinion” the Roadmap was one of three documents that would be “foundational” in the forthcoming discussions about merging ABAG and MTC—the other two are the HUD-funded, SPUR-directed Economic Prosperity Strategy and the ABAG staff report, People, Places, and Prosperity. These extreme positions should not be a surprise. They simply flesh out the market-guided, supply-side, privatizing, growth-to-the-max priorities that the BACEI and the Bay Area Council, the lobby for the region’s biggest businesses, have always embraced. What’s a surprise—indeed, a shock—is that these priorities have been endorsed by the executive director of the Association of Bay Area Governments, an organization that was founded to protect municipal authority. loss of local approval authority, state-mandated “by right” approvals of housing projects (which removes some discretionary approvals from project review processes), the creation of more “by right” zoning districts, or the creation of a regional hearing body to approve housing developments. For the record: state law does not require cities to permit a certain number of housing units. It requires the Housing Element in each city’s General Plan to zone for a certain number of units at a range of income levels in accordance with projected household growth. The RHNA numbers are determined by the California Department of Housing and Community Development. The recommendation to put “real teeth” in the RHNA process is not the Roadmap’s only assault on the local control of planning and on democratic government at large. Build—not plan, or zone, or even permit—but build sufficient housing stock to meet the demands of a growing regional population and to fill historic deficits.